The fact is, knowing is hard — both the finding things out and the knowing what to do about what you know or don’t know. 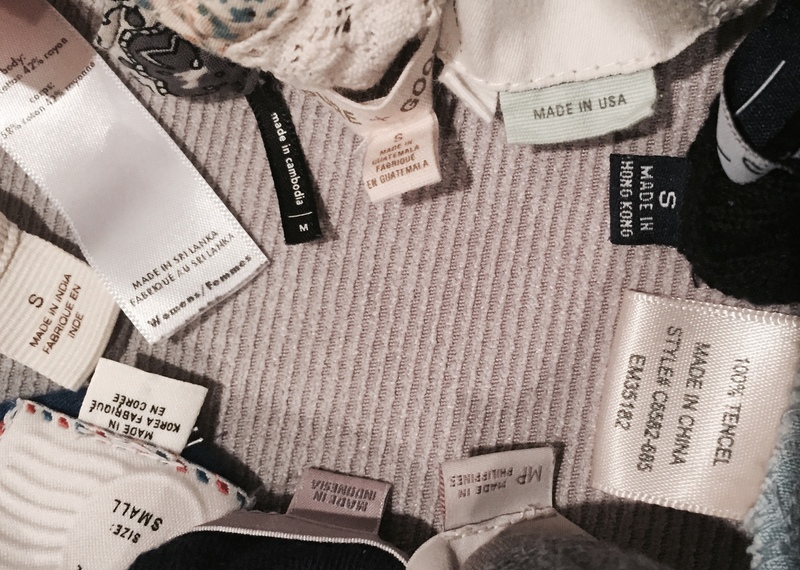 This entire month of Slow Fashion October has led me to take a deeper look- well, truthfully, just take a look at from where my clothing comes. I found three things in my closet that were made in the USA. One which is handmade, one a sweater of my grandma’s and a random sweatshirt. The rest were from around the world. Who knows how they were made, or who made them in the USA or otherwise. In this journey and growing consciousness, I’ve come to the realization that the first thing to do is to consume less. Not all I buy will be made local, not all the clothes will be handmade. I can definitely strive for that but I have to be honest, it won’t be 100% of the time. One thing that’s always been in the back of my head is that yes, it’s great to recycle and have less trash but it’s even better to consume less. Recycling doesn’t cancel out consumption. Buying books/yarn/needles to make sweaters, hats and cowls isn’t necessarily better. To consciously ask: do I need this? To be mindful of the choice I’m making (because it is a choice) and to find my middle ground. Because my middle ground won’t be your middle ground. And if I try and tackle this all at once, I won’t make any change. One thing is for sure, consuming is a difficult habit to break and knowing is hard. I have this basket. A mending basket. I was inspired to be more conscious of repairing, hemming, fixing, mending when I read the article: Put A Patch On It by Em Falconbridge in Issue 11, MEND of Taproot. To be honest, the basket is full of pieces to mend because although I put the clothing, dress up costumes and stuffies aside to be worked on, I never set the time aside to complete it. The task has never taken priority over the other to do’s, wants on my list. Intention but not execution. 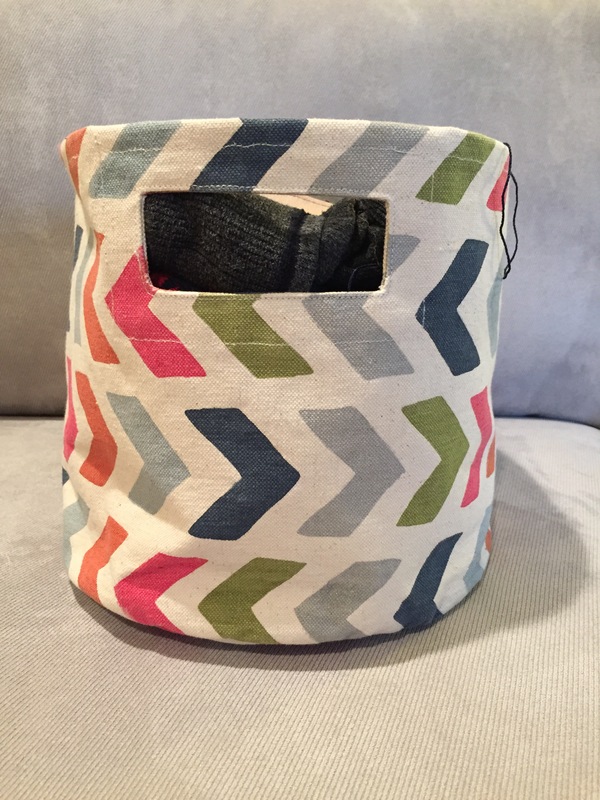 This week’s theme of WORN during the month long Slow Fashion October instigated by Karen Templer has shined a light on that basket full of mending and I have finally set aside some time to work on a few pieces. 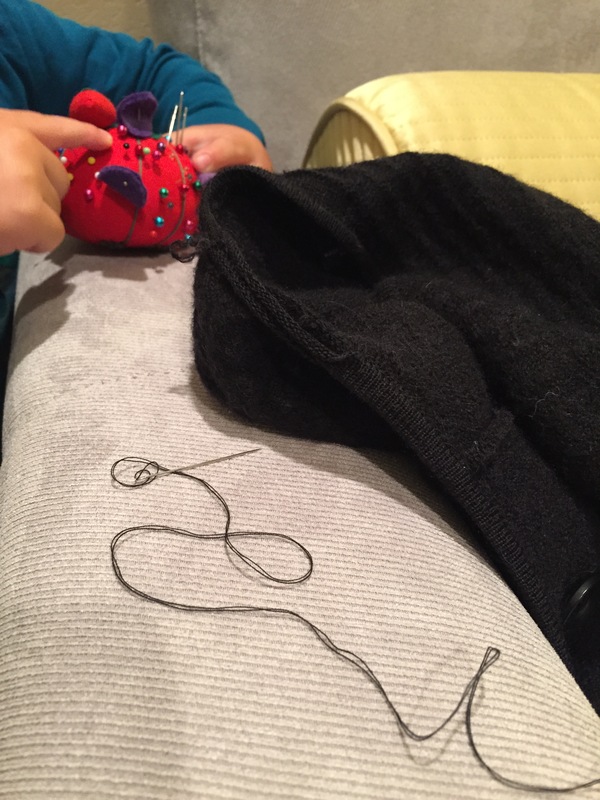 I mended two stuffies for my kids and repairing the neckline of a wool sweater coat I’ve had for a few years. It was so nice to slip the jacket on again- like having a new piece of clothing. 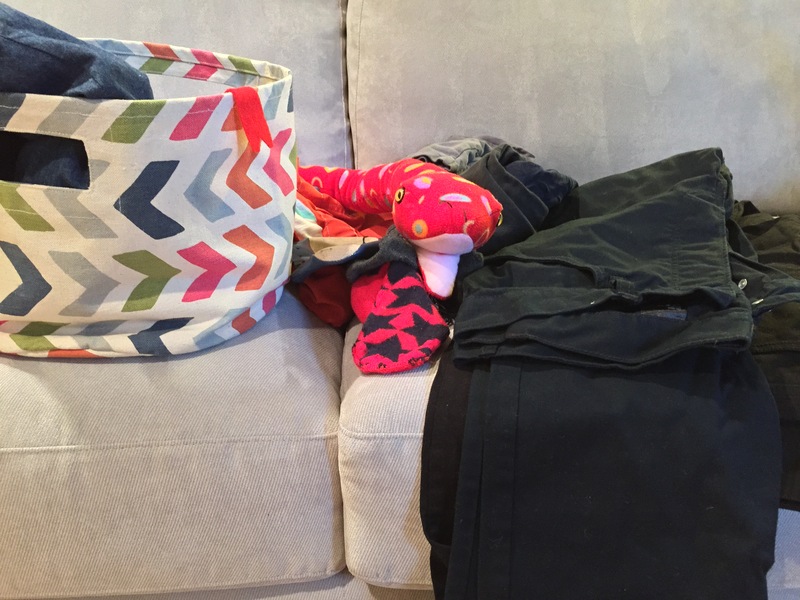 And….I noticed that some of the other clothing in the basket are now too small for my kids. Sometimes you miss the window of mending and wearing again. Longevity in children’s clothes is a challenge because of their rapid growth and wear and tear on the clothes. Luckily we can pass clothes from one sibling to the other, and then on to family, friends or great charities in the area. I seek out clothes that will wear well and can be passed on to balance the knowledge that at this point, we are lucky to get a 6-12 month life-span out of a single piece. Longevity in an adult wardrobe is different. Hand-washing, line drying, mending (when you can get to it) all increase the life and quality of clothing. But longevity of clothes is also dependent on maintaining the same body shape and size. I’m rounding the corner, seeing a glimpse of my pre-babies body and aim to pass that for an even healthier one. So naturally I can’t wear my maternity or post maternity clothing and my shape has changed post-baby that many of my clothes pre-baby don’t fit the same way. Slow Fashion October has come at a opportune time. It has created a space for me to step back and look inside my closet. In the past, I’d pull what didn’t work, fill a black plastic bag for donation and then fill the closet back up again with clothes that worked in the moment. That was ok, that’s what I needed at the time. But now, I’m asking myself to go “shopping” in my closet first and see what I find: I mended the black wool sweater coat and I re-discovered an old pair of boots; finally hemming adds some well-fitting pants to the mix. The biggest change is not rushing out to fill up the closet with clothes because they are on sale and are good enough for now; focusing on what is needed and not the instant gratification of a want. And while my body will continue to change, it doesn’t mean I have to continue to wear “disposable” clothing. 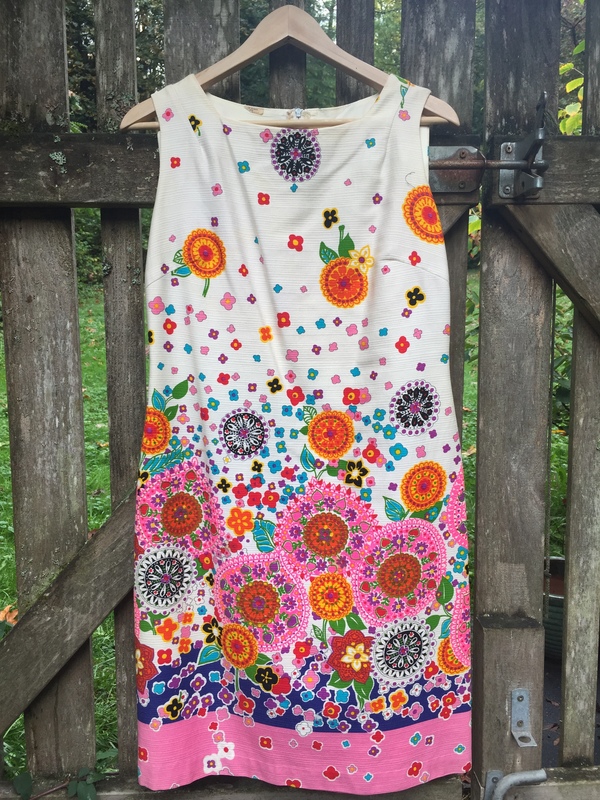 As I strive to find the balance in clothing for my children, the same needs to be done for myself: a balance between a few meaningful store bought pieces with an eye to longevity, more handmade pieces and working through what’s in the mending basket will get me closer to the more conscious wardrobe I desire. The intention is there, and the execution will follow, slowly. as in your proudest accomplishment / most loved item / most frequently worn item / thing you saved up for / investment pieces / thing you worked a long time on / oldest thing that’s still in rotation. Many of my clothes hold stories, moments in time. The dress, above, I wore the day I met my husband, 15 years ago. I picked it up at a thrift store because at the time I was a fresh theatre college graduate and didn’t have much disposable income. It was a fun dress to wear to a party; a dress in which salsa dancing could happen. It made an appearance at my sister’s 8th grade graduation and a host of other events until it was worn out. But it has stayed in the closet along side my treasured wedding dress. Many of my clothes also serve as a bookmark, holding the places I’ve traveled around the world. This top, purchased in India when I attended the wedding of a dear friend, brings to the surface a trip of a lifetime, taking me back to the intertwined chaos and beauty of that country. It was worn a lot upon returning home but it hasn’t been it in rotation for a while. It’s not an easy top for a nursing mom. I’m drawn to bright colors, although there is a lot of black on the hangers and in the drawers. 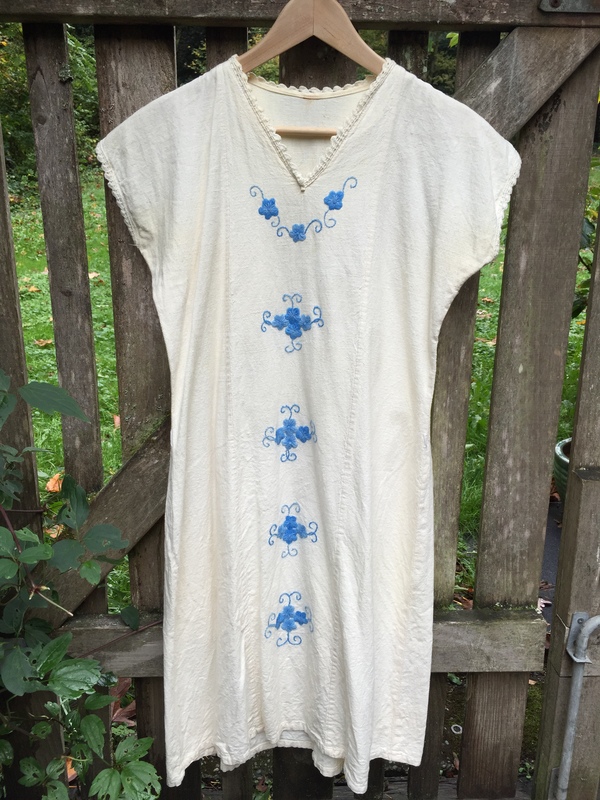 Light, cotton pieces with embroidery often find their way into my closet. Someday, I intend to make some of my own, inspired by the beautiful embroidery I saw while in Central and South America. The daily uniform: a pair of jeans and my fleece. This tells the story of where I am right now: wearing clothes that hold up and can be thrown on day after day but don’t have a ton of style. These jeans are also one of what I consider to be investment pieces in my wardrobe although they were a gift. They were my first pair of quality jeans and will always bring me back to the time around my wedding and the generosity of others. Buying investment pieces of clothing is not a habit; it’s something hard to justify. It’s a fear, almost, to have those items in my closet. Perhaps I’ll just look at them on the hanger instead of wearing them, too timid to touch, saving them for special occasions and then not liking them. It’s ironic though, because I imagine less money would be spent and there would be a deeper love of fewer, high-quality clothes. 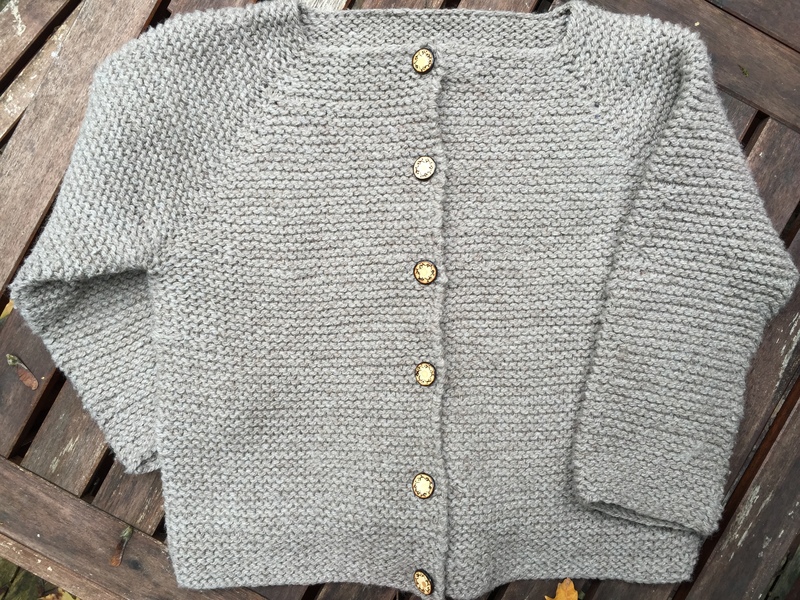 And here is my proudest accomplishment, my first knitted sweater, Annabel Cardigan by Carrie Bostick Hoge. It took 6 months to knit, with many mistakes that I ripped out only to begin again. The buttons came from a sweet yarn shop on a trip this past summer, imbuing it with more story and life. It was a huge, rewarding, learning process; a different kind of investment piece. One of time, money and love that I created; one that I won’t be afraid to use. Isn’t that funny? I probably wouldn’t wear an expensive knit sweater everyday if I purchased in a store but have no problem when made by my own two hands. The intention is to make clothes to wear, not to have them sit. And although it may turn out to be a monument of learning that I don’t wear, right now it’s pure love and I can’t wait for it to be cold enough to wear most days. It may push the fleece hoodie to the side for a while. Going through the clothes in the closet revealed that there are many pieces that are indeed, loved, but still not in rotation. They still hang in my closet because I love looking at them, feeling them in my hands and letting my mind wander. I struggle with this: do I hold onto a closet full of clothes that I cherish because of the memories but don’t in fact wear anymore? The simple answer is: probably not. It’s something to work through and find balance between those memories, actually wearing some of the clothes again and letting go. There is a sense that my uniform is changing; what’s in my closet is beginning to shift. Clothes tell the story of where you’ve been, where you’re at and perhaps where you’re headed. When the days become shorter and the leaves start to fall, thoughts travel to apple picking and pumpkin patches. It’s an Autumn ritual; a tradition that marks the years for our family. We’ve missed a few, and sometimes have just made it to the grocery store pumpkin stand. But the intention is always there and the cooking and baking that comes along welcomed, no matter if we picked them ourselves or not. 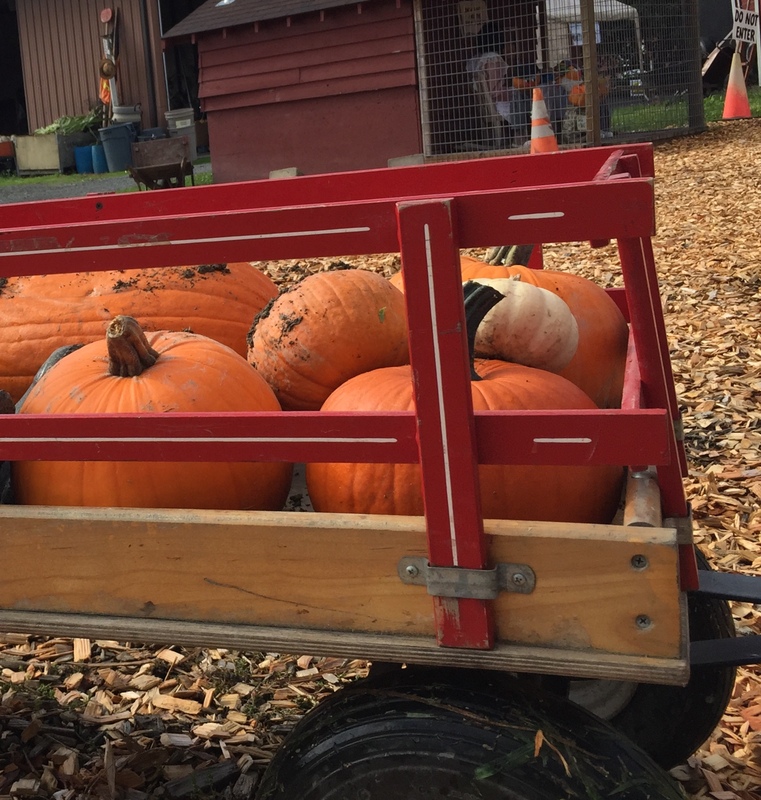 This year we hit the pumpkin patch early and brought home a collection of pumpkins big and small. 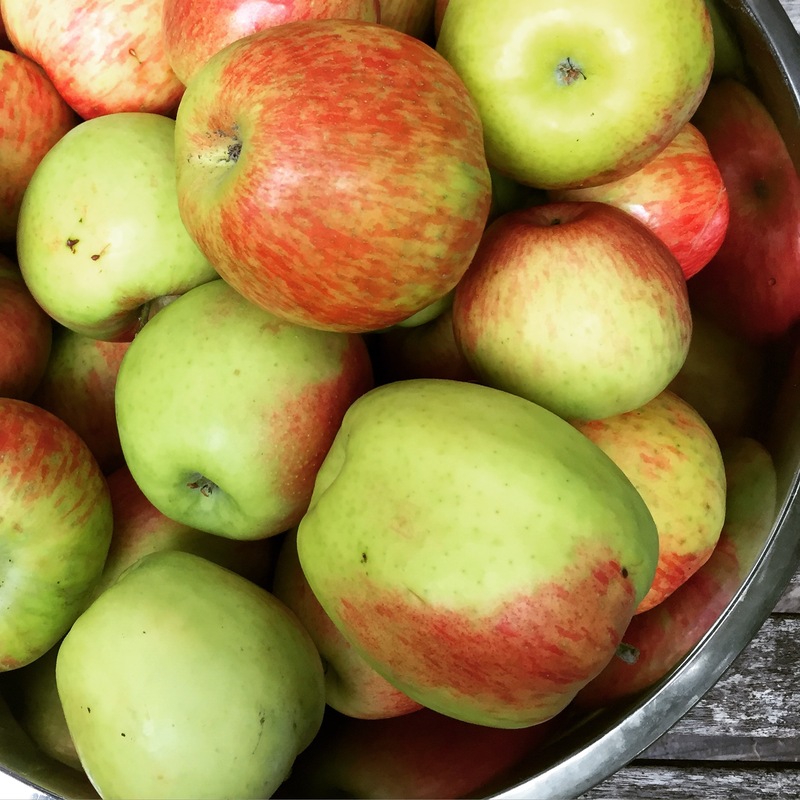 The apples came and went quickly and we enjoyed picking a few Honey Crisps and Jogengolds. With our apples we made a delicious applesauce and have plans for an apple cake and pie. 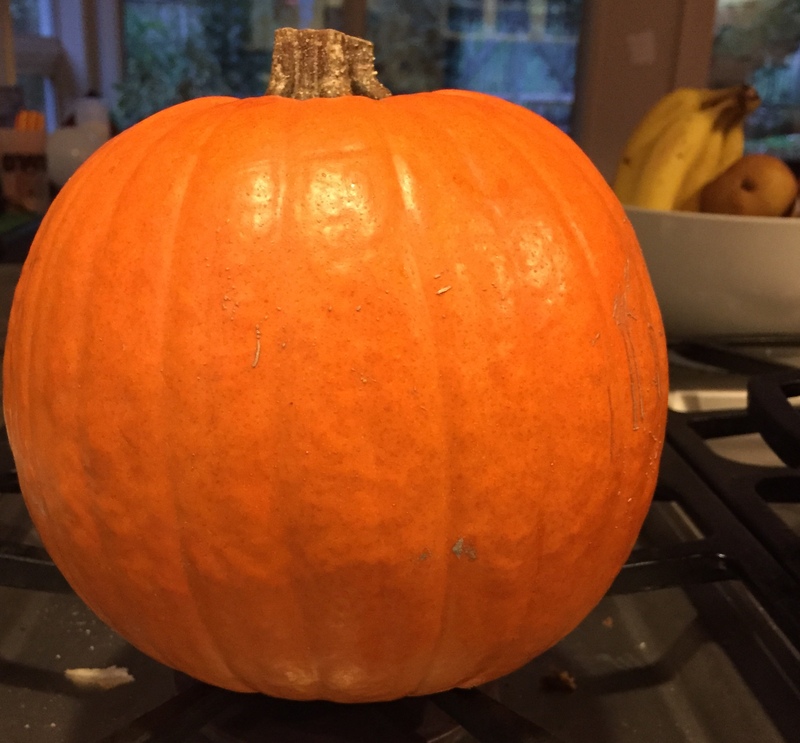 We always choose a sugar pumpkin or two to roast along with our carving selections. 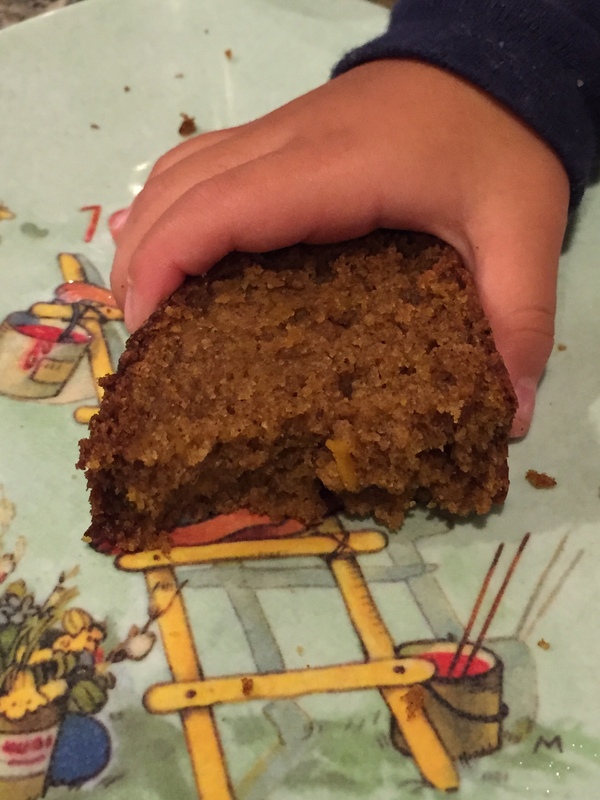 This year with yummy homemade purée we’ve baked pumpkin muffins and quick bread; oatmeal pumpkin pancakes and are saving some for pumpkin pie. Baking in our house is wheat and dairy free; it’s fun to adapt new recipes plus bring back old favorites. Now we just have to get to carving and the pumpkin season will be complete. Combine the flour, salt, sugar and baking soda. Stir the pumpkin, oil, eggs, water and spices together and fold into dry ingredients until just mixed. Add nuts, if using. Pour into a greased loaf pan (I use Earth Balance to grease my pans). Bake 50-60 minutes. You can also make muffins by lining a muffin pan, filling 3/4 of the cup and bake for 25-30 minutes. 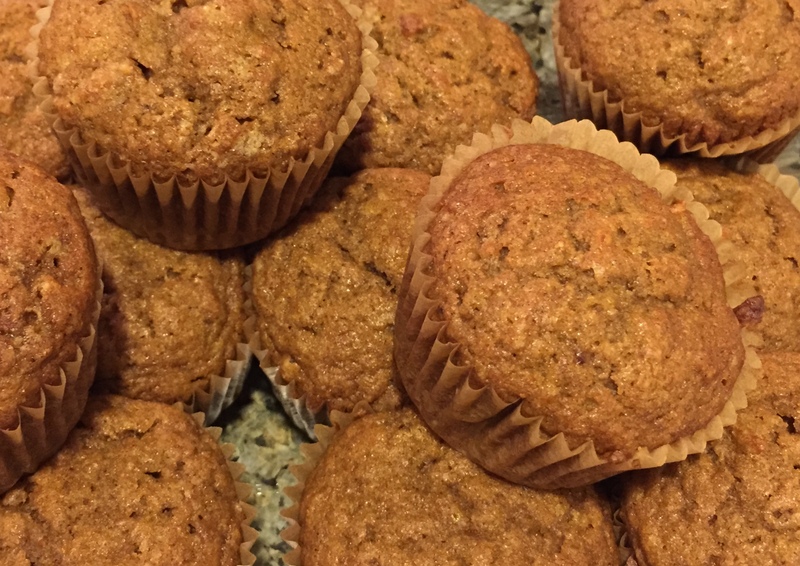 It is also easy to double this recipe and put the extra muffins or loaf in the freezer. 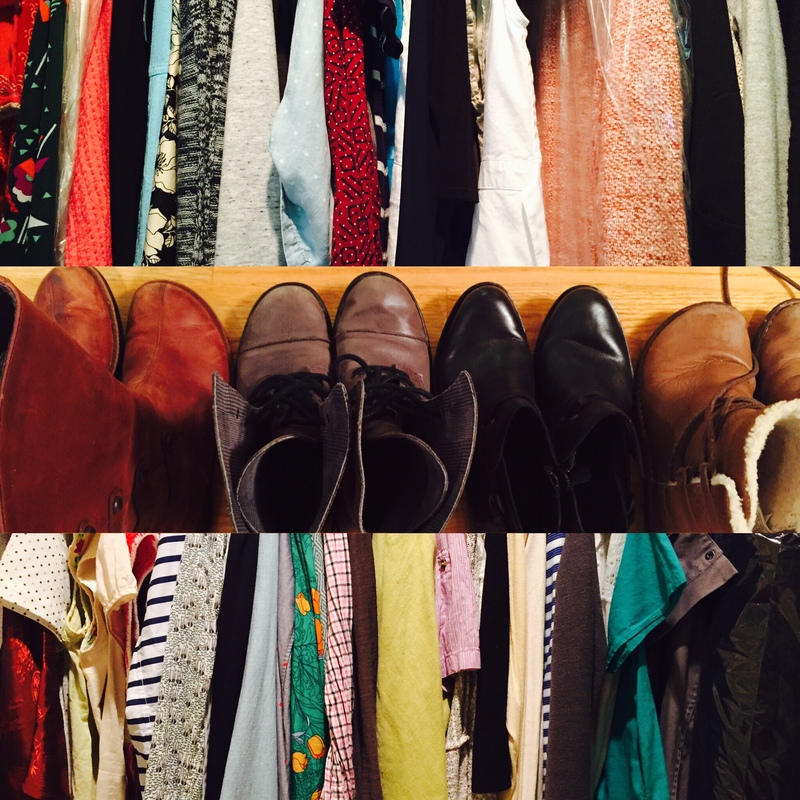 This week’s theme of Slow Fashion October is Small; a prompt to think about what makes up a wardrobe. 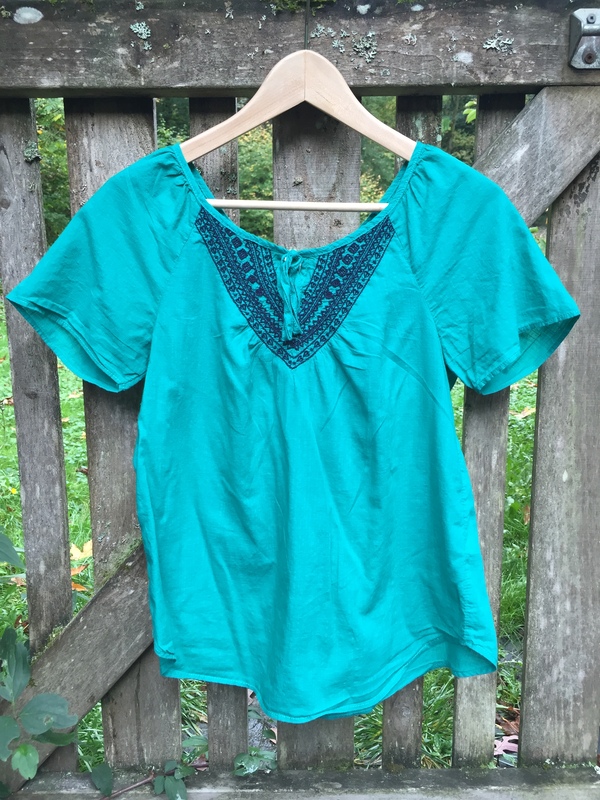 I must confess there are virtually no handmade, small batch or indie made clothes with an eye to sustainability in my closet. There are a few hand-me-ups from my sister and hand-me-downs I saved from my grandma and one hand-knitted sweater. I don’t consider myself to be all that stylish or “on trend”. I don’t replenish my wardrobe each season. 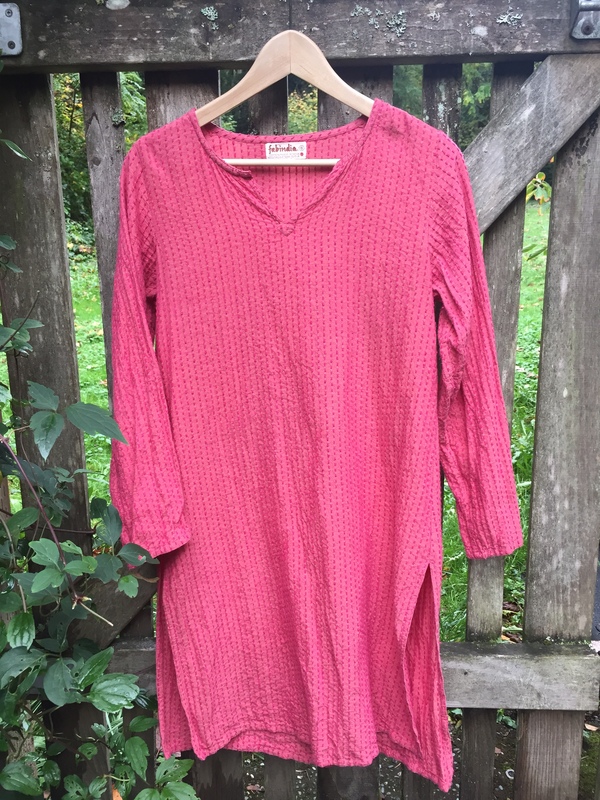 I mainly buy utilitarian clothing on sale that fit pretty well and can be worn daily; clothes I don’t have worry about if grubby hands/feet/paws are smeared all over them. 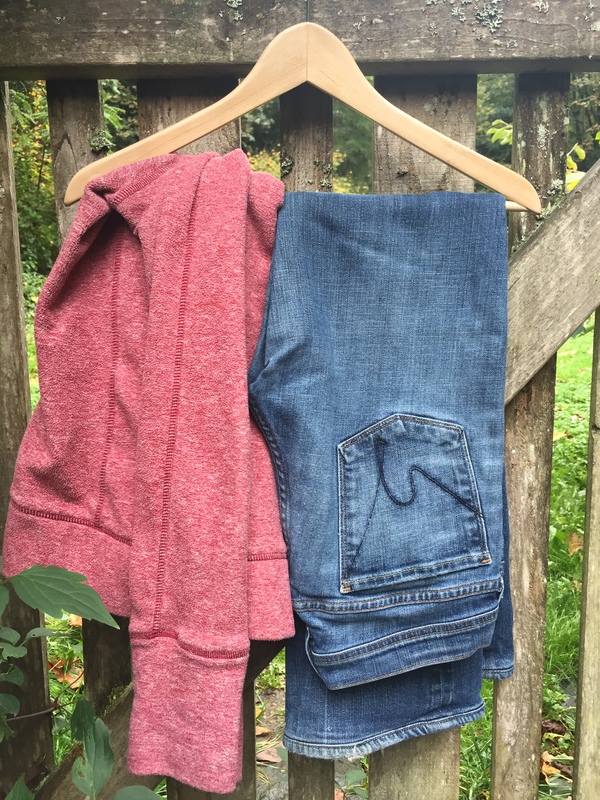 My hardest working pieces in my closet are jeans and a fleece hoodie. That doesn’t mean I have few clothes in my closet. It means that I have lots of clothes that don’t fit that great and are pretty generic. Over this past summer, I wanted to add a few more pieces to my wardrobe. Ones that I could wear often, that didn’t break the bank, felt good on and had style. I pretty much struck out and instead of buying the same old things, I didn’t buy anything. I’m a petite person, so clothes either need 3 inches more in the shoulder, stretch across the bust or the waist hits at my thighs. Most small batch/indie clothing are not made for my body type, let alone mainstream manufacturers. So, I made a decision to learn how to make my own useful clothing; to fill my closet with clothing that fits, I love and am proud to wear. It’s a great idea but a lot harder to put in practice. I have limited sewing knowledge and there is a big learning curve and adjusting patterns for my body is still above my skill level. It would be so much easier to just go and buy a “good enough for now” top/dress/sweater. But I don’t want that anymore. I’d like a more selective wardrobe of hardworking, mostly handmade clothes. It won’t happen instantly, but I’m determined. I was introduced to Karen Templer’s blog Fringe Association and Felicia Semple’s The Craft Sessions this past summer. I was instantly inspired. It led me to think about how I approach creativity and what it means to me (and how I haven’t been making much time for it these days). The Stash Less posts not only have made me aware about how I choose projects, but also how much I have already. And that has begun to bleed over to my wardrobe, books, and other crafts. I’ve been the type to purchase a book or craft supplies in earnest enthusiasm. I spend a few days or weeks plotting and planning and even starting but inevitably, life interrupts and it gets put in a pile or basket on the closet shelf. I rarely follow through with a project. Unfinished dress, and crocheted blanket; alphabet embroidery panel and wedding photo albums. I did finish knitting a sweater- my first ever- this past July. That gave me confidence that I can indeed finish and start a project. I decided to start this blog as a way to carve out time to work on various projects. To make my creative endeavors more of a priority. A challenge of sorts: to follow through, explore, learn, make and be brave. When Karen Templer introduced Slow Fashion October I immediately knew I wanted to participate, excited to join a growing movement inside of myself as well as a greater community. I instantly posted on Instagram all the projects I wanted to complete. And then I realized I’m doing the same thing I always do: setting myself up with wonderful and lovely projects, gathering all the supplies along with unrealistic expectations. I need to choose one or two and go about it slowly. So I think of this October as the beginning of a long journey. Finding my way to a wardrobe of known-origins full of handmade items. Completing a few projects before buying supplies for the next one. With that in mind, I revise my goals: I will figure out how to finish the dress and continue knitting on my Charlotte Light Cardigan. It’ll be hard with all the beautiful, amazing possibilities out there to make but the way I’ll participate in Slow Fashion October is to take it slow.